The book of Habakkuk is only three short chapters. Not much is known about Habakkuk’s background. He isn’t mentioned anywhere else in the Old Testament. We know he was a prophet of God and He lived during the reign of the wicked King Jehoiakim of Judah. This small book records a conversation Habakkuk had with the Lord. Habakkuk was troubled by all the evil and wickedness surrounding him in Judah. He had been praying and interceding on behalf of the people of Judah. He must have been frustrated and just wanted answers. He prayed and asked the Lord how much longer must there be violence everywhere? How long must he see the evil surrounding him and watch all the misery? He saw destruction and violence. He was surrounded by people who loved to argue and fight. The law was corrupt and there was no justice in the courts. The wicked far outnumbered the righteous. He had been crying out to God for help and wanted to know why God was not listening. The Lord responds, “Look around at the nations; look and be amazed! For I am doing something in your own day, something you wouldn’t believe even if someone told you about it.” Then the Lord goes on to tell Habakkuk how He plans on using an even more wicked nation to bring judgment on Judah. Well this brings even more concern to Habakkuk’s heart and he proceeds to ask the Lord more questions about what is to come for the future of Judah. The Lord responds again to Habakkuk’s questions and complaints confirming the judgment to come. The book ends with Habakkuk realizing God’s ways are so much higher than his. He trusts God and His ways, even if he did not understand it. The questions end and the praises begin. This is so true and this is the example Habakkuk set for us; Habakkuk had many questions and complaints for the Lord and he committed them to God. He found his peace in rejoicing in the face of the turmoil and devastation surrounding his people. He declared his faith in God to strengthen him in the midst of all the drama. He went from being anxious and making complaints, to being full of confidence in God and making statements of faith. He trusted the Lord would work this all out for their good. He trusted God to help him through the situation and to be his strength. He found peace knowing God was in control. He determined no matter what happened, no matter how bad it got, he would find his joy in the God of his salvation. 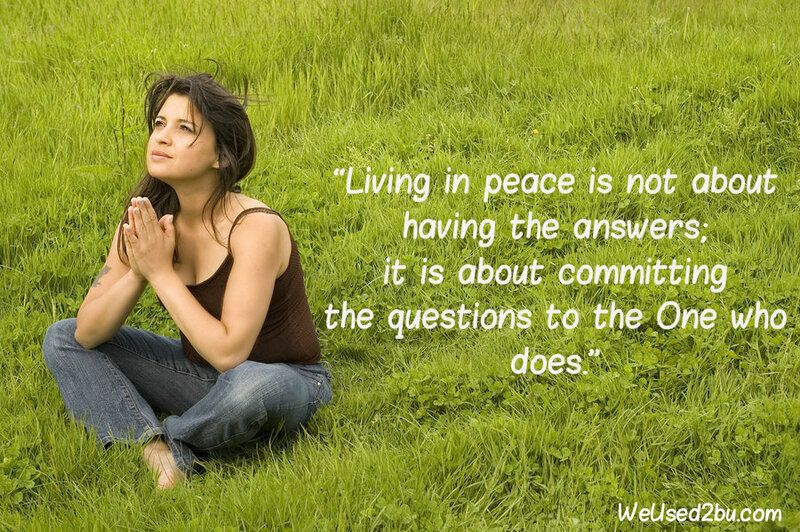 Often times it’s hard for believers to live in peace. Many are so worried about their circumstances or problems they are consumed with fear and anxiety. Fear has such a serious stronghold on their life they have to be medicated to treat the anxiety attacks- not that there is anything wrong with taking medication. I am saying this because this used to be me. Although I loved the Lord and I did trust Him I still gave the spirit of fear my ear. I would listen to all the “what if’s” the spirit of fear would present to me about my circumstances. I allowed the fearful thoughts to drown out the Word of God and steal my peace and joy. We don’t have to allow our circumstances to overwhelm us. We have to know our Lord is a Just God who has a plan at all times. The world would say it’s natural to fear. Of course it’s natural, but we forget we are not just natural human beings any more. We are new creations in Christ Jesus and children of the Most High God. We have the Holy Spirit living in us. We are not supposed to be led by the natural, the flesh, or the world. We are not to walk by sight. We are to walk by faith. We are to be led by the Spirit of God. If we want to have the peace of God reigning in our hearts and minds then we have to learn to allow faith and hope in God to become our natural reaction to our circumstances. It’s OK to have questions and concerns, but we have to bring them to the Lord and allow Him to speak to our hearts. Then trust Him to bring us through whatever it is we are facing. May our Lord help us to live by faith instead of by reason. May our joy and peace be in knowing our God is faithful and sovereign. Help us to praise you regardless of what is going on around us. Let our praises be prompted by a knowing and love for you regardless of our circumstances. Let us praise you because we know you see all of our struggles. Thank you for allowing us to come to you open and real with our questions, doubts, and fears. In Jesus name. Amen! Previous post ← Day 22: Is Anything To Hard For God?